The results of the Cr(VI) MOA research study have been published in the peer-reviewed scientific literature. To date, this research has resulted in nineteen publications in eleven scientific journals, several of which have received awards from the Risk Assessment Specialty Section of the Society of Toxicology. The research team has also presented the findings at a number of scientific conferences, including the Society of Toxicology and the ToxForum. All of the articles listed below are Open Access with the exception of the Big Blue® Rat studies. Thompson CM, Kirman CR, Hays SM, Suh M, Harvey SE, Proctor DM, Rager JE, Haws LC, Harris MA. 2018. Integration of mechanistic and pharmacokinetic information to derive oral reference dose and margin-of-exposure values for hexavalent chromium. 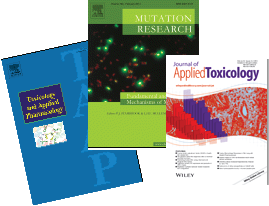 Journal of Applied Toxicology. 38:351-365. Thompson CM, Wolf JC, McCoy A, Suh M, Proctor DM, Kirman CR, Haws LC, Harris MA. 2017. Comparison of toxicity and recovery in the duodenum of B6C3F1 mice following treatment with intestinal carcinogens captan, folpet, and hexavalent chromium. Toxicologic Pathology. 45(8):1091-1101. Thompson CM, Suh M, Proctor DM, Haws LC, Harris MA. 2017. Ten factors for considering the mode of action of Cr(VI)-induced gastrointestinal tumors in rodents. Mutation Research/Genetic Toxicology and Environmental Mutagenesis. 823:45-57. Thompson CM, Young RR, Dinesdurage H, Suh M, Harris MA, Rohr AC, Proctor DM. 2017. Assessment of the mutagenic potential of hexavalent chromium in the duodenum of big blue rats. Toxicology and Applied Pharmacology. 330:48-52. Kirman CR, Suh M, Proctor DM, Hays SM. 2017. Improved physiologically based pharmacokinetic model for oral exposures to chromium in mice, rats, and humans to address temporal variation and sensitive populations. Toxicol Appl Pharma. 325:9-17. Thompson CM, Rager JE, Suh M, Ring CL, Proctor DM, Haws LC, Fry RC, Harris MA. 2016. Transcriptomic Responses in the oral cavity of F344 rats and B6C3F1 mice following exposure to Cr(VI): implications for risk assessment. Env Mol Mut. 57:706-716. Silvio De Flora, Anna Camoirano, Rosanna T. Micale, Sebastiano La Maestra, Vincenzo Savarino, Patrizia Zentilin, Elisa Marabotto, Mina Suh, Deborah M. Proctor. 2016. Reduction of hexavalent chromium by fasted and fed human gastric fluid. I. Chemical reduction and mitigation of mutagenicity. Toxicology and Applied Pharmacology. 306:113-119. Christopher R. Kirman, Mina Suh, Sean M. Hays, Hakan Gürleyük, Russ Gerads, Silvio De Flora, William Parker, Shu Lin, Laurie C. Haws, Mark A. Harris, Deborah M. Proctor. 2016. Reduction of hexavalent chromium by fasted and fed human gastric fluid. II. Ex vivo gastric reduction modeling. Toxicology and Applied Pharmacology. 306:120-133. Cullen JM, Ward JM, Thompson CM. 2016. Reevaluation and classification of duodenal lesions in B6C3F1 mice and F344 rats from 4 studies of hexavalent chromium in drinking water. Toxicol. Path. 44(2):279-89. Thompson CM, Seiter J, Chappell MA, Tappero RV, Proctor DM, Suh M, Wolf JC, Haws LC, Vitale R, Mittal L, Kirman CR, Hays SM, Harris MA. 2015. Synchrotron-based imaging of chromium and γ-H2AX immunostaining in the duodenum following repeated exposure to Cr(VI) in drinking water. Toxicol Sci. 143(1): 16-25. Thompson CM, Wolf JC, Elbekai RH, Paranjpe MG, Seiter JM, Chappell MA, Tappero RV, Suh M, Proctor DM, Bichteler A, Haws LC, Harris MA. 2015. Duodenal crypt health following exposure to Cr(VI): Micronucleus scoring γ-H2AX immunostaining, and synchrotron X-ray fluorescence microscopy. Mutat Res. 789-790:61-66. Thompson CM, Young RR, Suh M, Dinesdurage HR, Elbekai RH, Harris MA, Rohr AC, Proctor DM. 2015. Assessment of the Mutagenic Potential of Cr(VI) in the Oral Mucosa of Big Blue Transgenic F344 Rats. Environ Mol. Mutagen. 56: 621-628. Young RR, Thompson CM, Dinesdurage HR, Elbekai RH, Suh M, Rohr AC, Proctor DM. 2015. A Robust Method for Assessing Chemically Induced Mutagenic Effects in the Oral Cavity of Transgenic Big Blue Rats. Environ Mol. Mutagen. 56:629-636. Suh M, Thompson CM, Kirman CR, Carakostas M, Haws LC, Harris M, Proctor D. 2014. High concentrations of hexavalent chromium in drinking water alter iron homeostasis in F344 rats and B6C3F1 mice. Food and Chemical Toxicology. 65:381-388. Kirman CR, Aylward LL, Suh M, Harris MA, Thompson CM, Haws LC, Proctor DM, Lin SS, Parker W, Hays SM. 2013. Physiologically based pharmacokinetic model for humans orally exposed to chromium. Chemico-Biological Interactions. 204(1): 13-27. pii: S0009-2797(13)00082-3. DOI: 10.1016/j.cbi.2013.04.003. Thompson CM, Proctor DM, Suh M, Haws LC, Kirman CR, Harris MA. 2013. Assessment of the mode of action underlying development of rodent small intestinal tumors following oral exposure to hexavalent chromium and relevance to humans. Critical Reviews in Toxicology. 43(3): 244-274. Kirman, CR, Hays, SM, Aylward, LL, Suh, M, Harris, MA, Thompson, CM, Haws, LC, Proctor, DM. Physiologically based pharmacokinetic model for rats and mice orally exposed to chromium. Chem Biol Interact. 200(1): 45-64. Kopec, A.K., C.M. Thompson, S. Kim, A.L. Forgacs, T.R. Zacharewski. 2012. Comparative Toxicogenomic Analysis of Oral Cr(VI) Exposure Effects in Rat and Mouse Small Intestinal Epithelium. Toxicol Appl Pharmacol. 262(2): 124-38. Kopec, A.K., Kim, S., Forgacs, A.L., Zacharewski, T.R., Proctor, D.M., Harris, M.A., Haws, L.C, Thompson, C.M. 2012. Genome-wide gene expression effects in B6C3F1 mouse intestinal epithelia following 7 and 90 days of exposure to hexavalent chromium in drinking water. Toxicology and Applied Pharmacology. 259(1):13-26. Proctor, D.M., Suh, M., Aylward, L.L., Kirman, C.R., Harris, M.A., Thompson, C.M., Gürleyük, H., Gerads, R., Haws, L.C., Hays, S.M. 2012. Hexavalent chromium reduction kinetics in rodent stomach contents. Chemosphere. 89(5): 487-93. Thompson, C.M., Y. Fedorov, D.D. Brown, M. Suh, D.M. Proctor, L. Kuriakose, L.C. Haws, M.A. Harris. 2012. Assessment of Cr(VI)-Induced Cytotoxicity and Genotoxicity Using High Content Analysis. PLoS ONE. 7(8): e42720. Thompson, C.M., J.G. Hixon, D.M. Proctor, L.C. Haws, M. Suh, J.D. Urban, M.A. Harris. 2012. Assessment of Genotoxic Potential of Cr(VI) in the Mouse Duodenum: An In Silico Comparison with Mutagenic and Nonmutagenic Carcinogens Across Tissues. Regul Toxicol Pharmacol. 64(1): 68-76. Thompson, C.M., D.M. Proctor, M. Suh, L.C. Haws, C.D. Hebert, J.F. Mann, H.G. Shertzer, J.G. Hixon and M.A. Harris. 2012. Comparison of the Effects of Hexavalent Chromium in the Alimentary Canal of F344 Rats and B6C3F1 Mice Following Exposure in Drinking Water: Implications for Carcinogenic Modes of Action. Toxicol Sci. 125(1):79-90. Thompson, C.M., D.M. Proctor,and M.A. Harris. 2012. Duodenal GSH/GSSG Ratios in Mice Following Oral Exposure to Cr(VI). Toxicol Sci. 126(1): 287-288. Thompson, C.M., D.M. Proctor, L.C. Haws, C.D. Hebert, S.D. Grimes, H.G. Shertzer, A.K. Kopec, J.G. Hixon, T.R. Zacharewski and M.A. Harris. 2011. Investigation of the Mode of Action Underlying the Tumorigenic Response Induced in B6C3F1 Mice Exposed Orally to Hexavalent Chromium. Toxicol Sci. 123(1): 58-70. Thompson, C.M., L.C. Haws, M.A. Harris, N.M. Gatto and D.M. Proctor. 2011. Application of the U.S. EPA Mode of Action Framework for Purposes of Guiding Future Research: A Case Study Involving the Oral Carcinogenicity of Hexavalent Chromium. Toxicol Sci. 119(1): 20-40.